Established in 1994 in order to protect the biodiversity and richness of the area it is on, the Kasu Brhamananda Reddy National Park covers about 156 hectares of land right smack in Hyderabad’s Jubilee Hills. 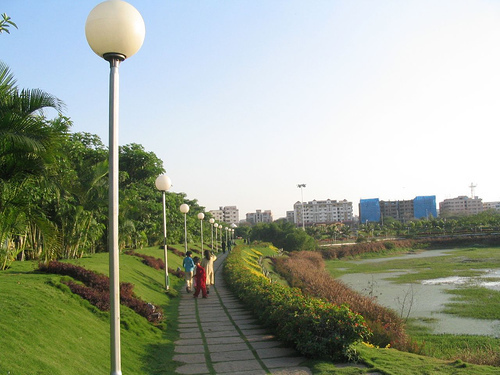 The park is named after Telangana’s former prime minister Kasu Brahmananda Reddy, and it is a rather unique park in its own way. Aside from being picturesque and teeming with flora and fauna life like most national parks, it also has the magnificent Chitan Palace by the former Nizam of Hyderabad as well as other historic structures. The park is home to a wide variety of plant and animal life. There are over 600 species of plants and trees one can find within its vicinity, ranging from shrubs, herbs, to climbers and creepers, not to mention several pteridophytes and xerophytes. As for the fauna, the park is home to approximately 113 species of birds, 20 species of reptiles, 20 species of mammals, 15 species of butterflies, and a wide variety of invertebrates. While there are no large mammals present in KBR National Park, palm civets and small jungle cats can be found. The dense trees and foliage inside the park will most times cause a drop of temperature once one enters the park premises. It is a wonderful feeling of freshness and coolness that cannot be found in the humid and sweaty environment of the city. Most of all, good infrastructure of toilets, dustbins and benches backed by an able group of park custodians and maintenance crew assures that the park is clean and well-maintained throughout, preserving its beauty and grandeur for generations to come.